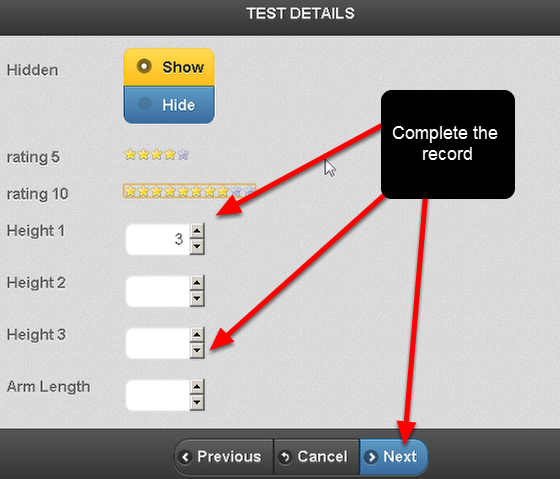 The image in the step here shows the Related Events that appear for entry when you access a Medical Record on the installed or online version. 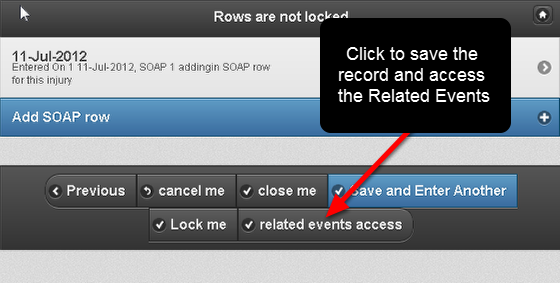 You can only access Related Events once a record has been saved and closed, or if you click on the "save and continue" or "save and access related events" buttons. 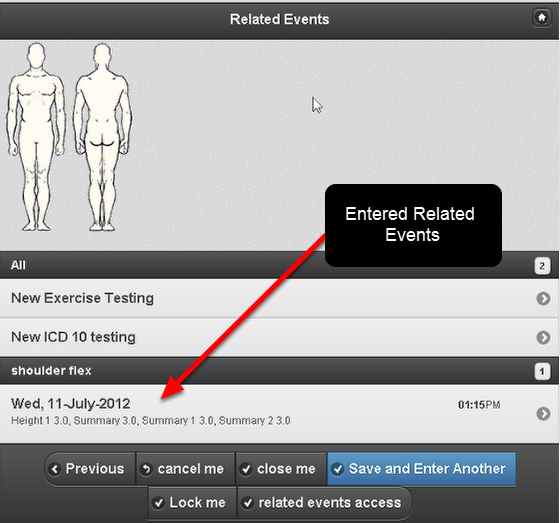 Access to Related Events has now been set up on the iPad/iPhone version. Now you can access the Related Events button (sometimes labeled Save and Continue) on the iPad/iPhone when you FIRST enter in a new injury record. When you first enter in a new entry (e.g. 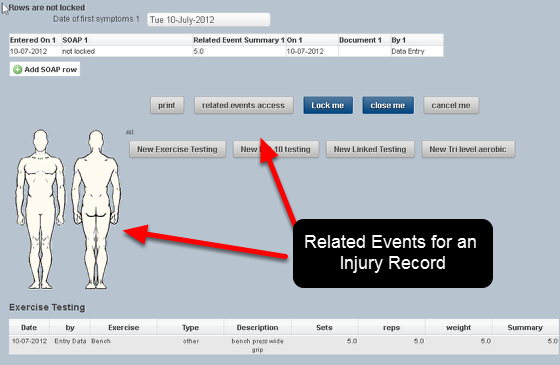 a new Medical Record or Injury Record) that has Related Events enabled for it, you can now click on the Save and continue or Save and Access Related buttons to Save the record on the system and access the Related Events feature. Depending on the way the Related Events are set up on your system, you might access them through a body diagram, through a list, or through both (as shown here). 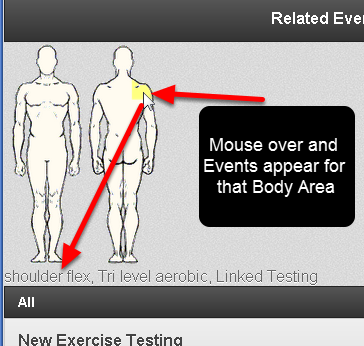 Related Events Body Diagram: Mouse over the body area and any Related Events appear. When you mouse over a Body Area and only one Related Event appears you can click directly on the body area and that Related Event Form will load. If there are two more Related Events for a body area these will appear below the Body Diagram. 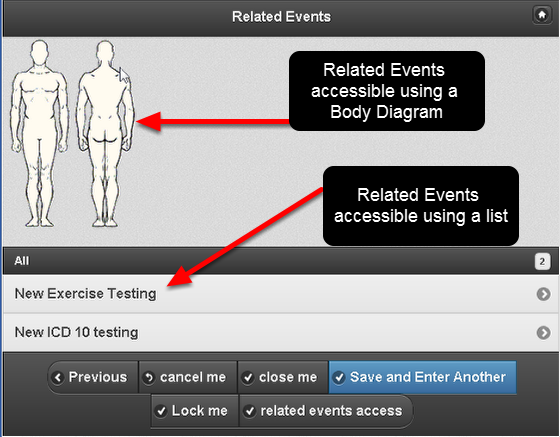 When you click on a body area with multiple Related Events an intermediate step occurs for you to select the correct Related Event (as shown in the image in the step below). 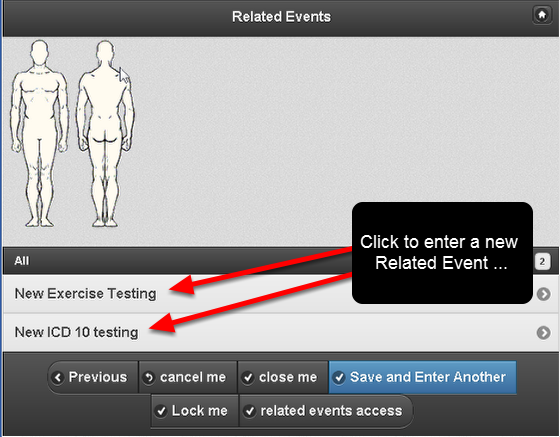 For multiple Related Events for a body part you need to click on the Related Event that you want to enter. For this example the shoulder flex will be selected. When the Related Event opens complete the record and save it. Any Related Events that have been entered will appear below the Related Events List and above the Save and Close button (even if your system is set up for the related Events to appear below the Save buttons on the main system). N.B. If you have a table where information from any Related Events is pulled back into the table then this will work online on the iPad/iPhone version (e.g. in a Medical SOAP table). 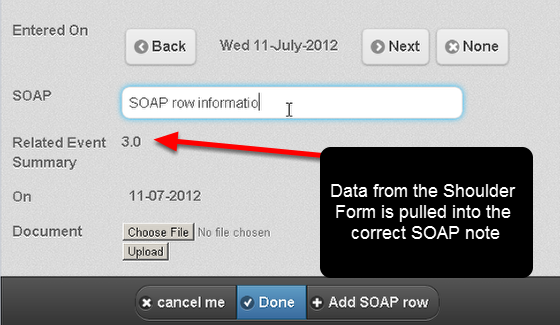 The example here shows the summary field information from the shoulder flex Related Event Form (entered on the 11th July) being pulled back into a SOAP note entered on the 11th July. 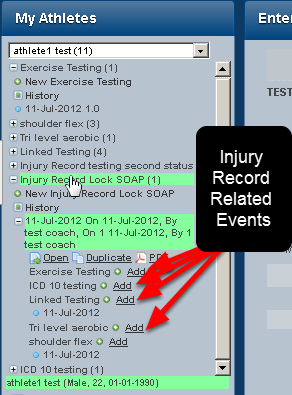 The SOAP notes row is part of a SOAP table in the Injury Record Form.